A tripple-whammy of wintry weather is arriving from Friday through Christmas, coating roads with snow and ice. AUGUSTA — The first of a three-part dose of winter weather arrived Friday, causing holiday travel headaches, resulting in long lines at stores for last-minute Christmas shoppers and forcing some people to change their plans. Three to 5 inches of snow was expected to fall Friday in central Maine, but it’s the freezing rain expected to come after it, on Saturday, that could make holiday travel especially challenging. 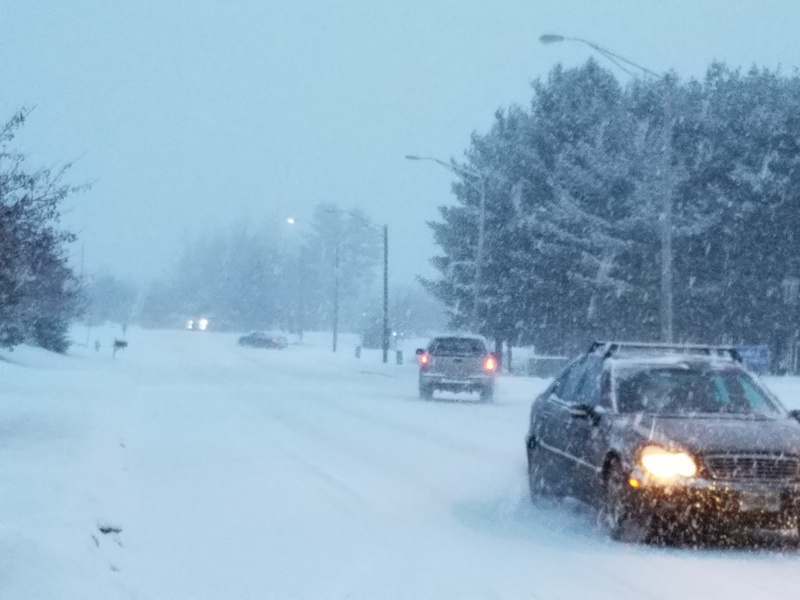 Snowfall started in the early afternoon, and the heaviest periods were expected later in evening, according to Justin Arnott, a meteorologist with the National Weather Service. Jones said Augusta planned to bring in early Saturday morning a crew of plow truck drivers who worked Thursday night, to be joined by another crew coming in later that day. The next round of precipitation should come Saturday, mostly during daylight hours, in the form of freezing rain, which could make travel even more treacherous. 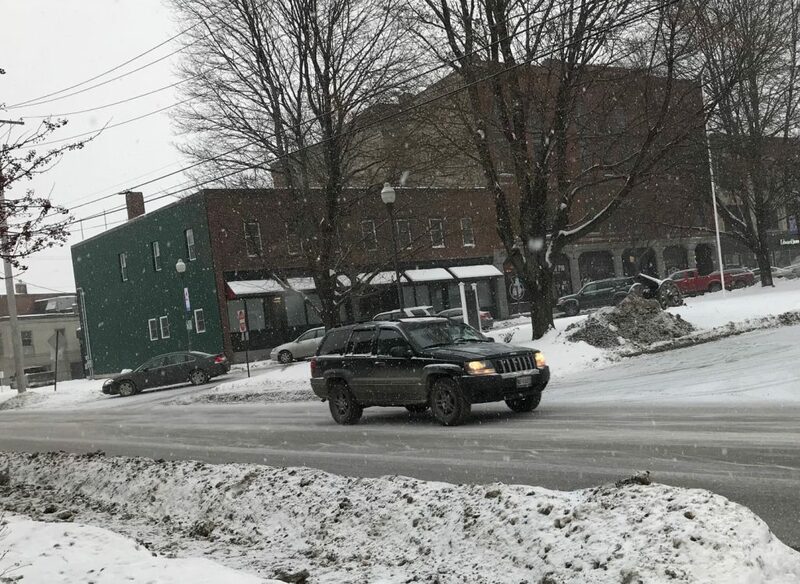 Arnott said the Augusta-Waterville area could see close to a quarter-inch of icing build up on surfaces from the freezing rain. “That’s enough to start bringing down some tree limbs, so scattered power outages are not out of the question,” Arnott said. He noted, however, that wind gusts were forecast to be light through Saturday. Sunday — Christmas Eve — looked better, Arnott said, with temperature in the 30s and no precipitation expected. That lull is expected to last just one day, however, with another system moving into the region on Christmas Day, Monday, that could bring another several inches of snowfall. Augusta Public Works has multiple new drivers this year, as high turnover left the city with a number of vacancies to fill. Jones said the city’s new drivers have met the challenge of the first couple of storms this year. The triple-whammy of stormy weather was expected to have widespread effects on people’s holiday travel and shopping plans through Maine and the rest of New England. Some people left earlier than planned. Others canceled their travel altogether. Utilities, including Central Maine Power Co., are monitoring the storms. The forecast of freezing rain on Saturday could mean heavy coatings of ice build-up on power lines and tree limbs, causing power outages. “CMP’s storm readiness teams have been holding planning meetings, and the company is pre-positioning personnel and equipment to ensure that adequate resources are in place to restore power outages that might occur as a result of the storm,” the company said in a news release. Meanwhile, the arrival of snow on Friday sent shoppers flocking to stores. Carts were filled with last-minute Christmas items, some more full than others. Stocking stuffers. Wrapping paper and bows. Gifts and gift cards, too. At the Maine Mall in South Portland, parking spots were hard to find. Inside, shoppers moved quickly to find what they came for. At grocery stores, every checkout line was open and lines extended into food aisles. The last-minute pre-holiday rush essentially was condensed into a few hours Friday morning as shoppers tried to get home before the weather turned worse. Josh Beatty, of Falmouth, was among the dozens of people waiting in line at Target in South Portland. His cart was full of gifts but he wasn’t that worried about the wait. It was the only stop he had to make Friday. Justin Arnott, a meteorologist with the National Weather Service in Gray, agreed that the timing of the storm is not ideal. “This is why some people go south in the winter, right?” he said. Portland Press Herald staff writer Eric Russell and The Associated Press contributed to this report.